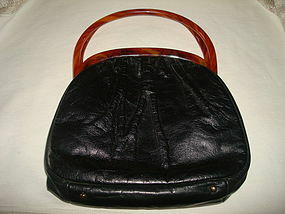 Wonderful vintage 1950's leather handbag with Lucite tortoise shell frame and handle. Including handles it measures 11 1/8" high x 9 1/2" wide. The black leather is still buttery!!! This wonderful bag is in fine condition for it's age!!! Can still be used for eye catching handbag or to be hung for decoration. 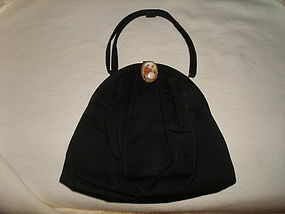 Lovely 1950's petite ladies fabric handbag. 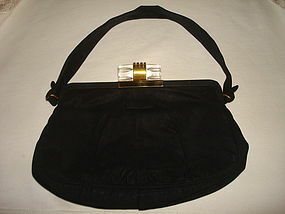 This vintage handbag is in fine condition and is satin lined and comes with a attached satin purse. It features a ceramic transfer design clasp featuring an elegant couple in 18th Century formal wear. This bag with strap measures 10 1/2" high. Without including the strap, this handbag measures 6 3/4" high x 7 1/2" wide. Also, it was made in the U.S.A!!! A lovely bag to either wear or hang for display!!! Wonderful Mid Century carnival glass rosary made in Italy. 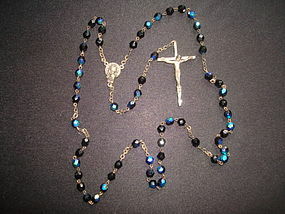 This rosary is in fine condition, measures 20" long with the cross being 2" long. There is a total of 54 carnival glass beads for the necklace and 5 more beads above the crucifix. Vintage Elvis memorial items that were made in 1977 after his death. This 2 items are in fine condition and come with the original bag. 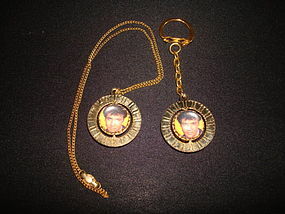 Both the pendant and the key chain have a medallion that 1 1/4" in diameter and each has a revolving charm that features a picture of Elvis on one side and the other side reads KING OF ROCK, ELVIS 1935-1977. 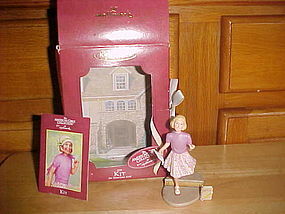 $ 100.00 - "SOLD - THANK YOU !!!" 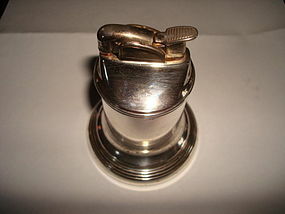 Wonderful vintage 1940's - 50's silver table cigarette lighter. This sterling Evans lighter is in fine condition and is signed on base EVANS U.S.A. 250213 and also has the famous Evans double lion and shield crest. The sterling body is signed STERLING with the silver company manufacturers mark as shown one of the photos. This lighter stands 3 1/4" tall. 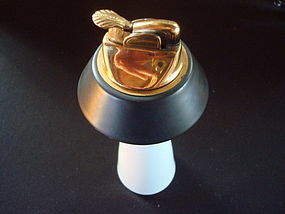 Sterling table cigarette lighter from 1950's. This lighter was made by GORHAM Silver Company and it is signed GORHAM STERLING with Lion and Anchor and two letters which I think are OB, then the number 366. 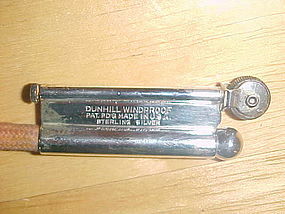 With the exception of the base being slightly out of round, this lighter is in fine condition. There is a letter J engraved as shown in one of the pictures. It measures 3 1/4" high. Gold plated custom after market Ford Falcon key blank. 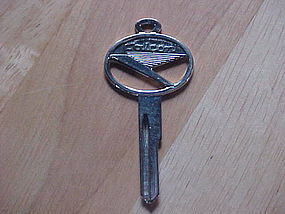 This key blank was made in the 1960's and fits Ford Falcons from 1960 - 1965. It will fit the ignition and door lock. It can be cut for actual use. A fine gift for a owner of a Classic Ford Falcon!!! 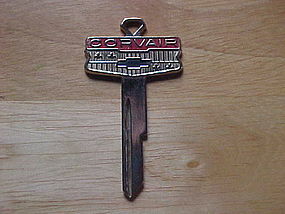 Classic gold plated Chevy Corvair key blank. This is an after market custom key blank made for Chevy Corvairs from 1960 and up. It has the classic Chevy Bow tie emblem and can be cut for use. It will fit both ignition and door. This would make a fine gift for a Corvair owner!!! 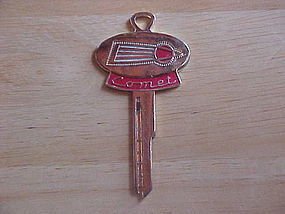 After market custom Mercury Comet Auto key blank with enameled emblem. 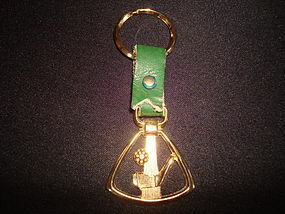 This gold plated key blank was made in the 1960's for Mercury Comets. It will fit the ignition, door and glove box for Mercury Comets from 1960 - 1964. A great gift for the owner of one of this Classic Comets!!!! 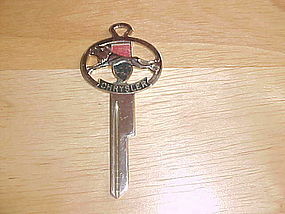 Beautiful gold plated customized key blank to fit Chryslers from 1956 - 1965. This key can be cut for use and it will fit the ignition and door. A great gift for VINTAGE CHRYSLER OWNER!!! $ 20.00 -"SOLD" - THANK YOU!!!! 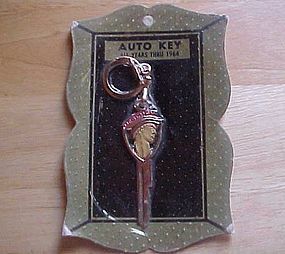 Beautiful gold plated key blank with key chain for Mercury Cars from 1956 - 1964. This is a after market custom key blank made in the 1960's. It is in Mint Condition in its original packaging!!! This key blank can be cut for actual use!!! This would be an exceptional gift to an owner of a classic 50's to 60's MERCURY!!! 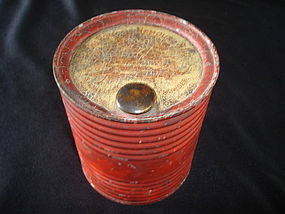 Rare WWII Timber Trench Cigarette Lighter made by DUNHILL. 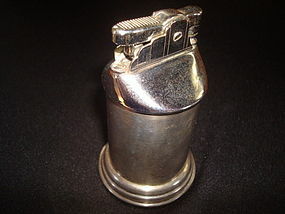 This sterling silver lighter is 2 1/4" long and is in fine condition, just needs a little more polishing up. A great gift for the serious lighter collector!!!! 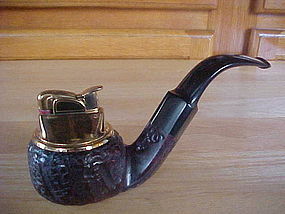 1950's genuine carve BRIARWOOD pipe with cigarette/cigar lighter inset. The lighter was made by EVANS and the Briarwood pipe is signed but I cannot make out the signature. This high quality lighter is in extra fine condition!!! It measures 6" long.